America's for-profit colleges are receiving as much as $33 billion in a single year from your tax money, and billions more from the pockets of students, a lot of whom are left deep in debt and jobless from their encounters with predatory schools. Many of the biggest for-profit colleges get close to 90 percent of their revenue from federal grants and loans, and yet the cost for students of attending, after financial aid awards, can be more than even private schools like Harvard. So what are for-profit colleges doing with all this money? Buying influence with the media. Bridgepoint Education recently disclosed a deal under which it will pay Forbes Media, publisher of Forbes magazine, at least $45 million over 12 years, to name Bridgepoint's Ashford University business school the Forbes School of Business and license Forbes content for Ashford programs. 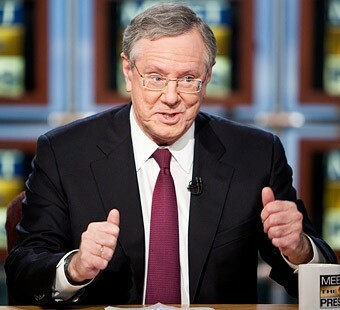 After Steve Forbes comes to Bridgepoint to sign this deal, will the journalists on his staff offer unbiased coverage of Bridgepoint, such as the fact that Bridgepoint spent in a recent year more than $2,000 per student on marketing and only $700 per student on instruction? Or that Senator Tom Harkin's 2012 investigation found so many problems at Bridgepoint that he called the institution "a scam"? The nation's biggest for-profit college, University of Phoenix, which itself spends only $892 per student on instruction but $2,225 on marketing, is the sponsor of NBC's annual Education Nation conference; an executive just told me she was disinvited from speaking at the NBC event this year after she was publicly critical of the University of Phoenix. The venerable Chronicle of Higher Education admitted last year that it was paid by Career Education Corporation (CEC), the fourth biggest for-profit college, to let CEC pick the speakers for a Chronicle event on reducing student loan defaults. CEC hosting such an event was a travesty: Its schools' own loan default rate -- 21.6 percent of its students defaulted within three years of leaving the school -- is almost double the average rate for all U.S. colleges. Also, the company recently agreed to pay $10.25 million to settle charges by New York's Attorney General that it significantly inflated its job placement rates, including by counting students as placed in a job because they worked at a one-day job fair. Paying CEOs big money. Corinthian Colleges paid its CEO Jack Massimino $3.4 million in 2011. According to a lawsuit filed by California's attorney general in October, Corinthian has systematically lied to students and regulators, especially about its job placement rates for students. EDMC, the second biggest for-profit college company, saw its stock plunge from $43 in 2006 to $2.84 in 2012, and student enrollments dropped significantly. EDMC responded by laying off hundreds of teachers, but increased the salary of its chairman, Todd Nelson, from $1.8 million in 2009 to $13 million in 2011. Meanwhile, the U.S. Justice Department and half a dozen states have sued EDMC for fraud, alleging the company paid its recruiters based on the number of students signed up, in violation of federal rules. Kaplan Education, which is under investigation by at least four state attorneys general, paid its CEO, Jonathan Grayer, $76 million when he resigned in November 2008. University of Phoenix co-founder John Murphy made enough money to buy this unbelievably lavish $27 million San Francisco mansion. Buying ads. If you use a computer, watch a TV, or ride a bus, you know that ads for career colleges, promising an easy path to a better future, are ubiquitous. Industry leader the University of Phoenix has been getting as much as $5 billion annually from taxpayers, and it has spent as much as $600 million a year on advertising; it has regularly been Google's largest advertiser, spending $200,000 a day. For-profit colleges also spend lavishly to buy "leads" or "pieces of businesses," also known as prospective students, from the shady world of lead generators, who use deception and confusion as tricks of the trade. Buying Members of Congress. The for-profit colleges regularly and heavily provide campaign contributions to Members of Congress, who in turn sell out their constituents -- veterans, single mothers, and other hard-working people abused by for-profit college deceptions -- to do the industry's bidding in Washington. The industry's biggest cheerleaders in the House are the two Republican members who oversee education policy -- Reps. John Kline (MN) and Virginia Foxx (NC) -- and each is rewarded handsomely by for-profit college donors. Kline raised $138,350 in the second quarter of 2013 from the for-profit college industry -- almost 25 percent of the money he raised in that period for his campaign and political action committee. Two of Foxx's three top donors in the last election cycle were the political action committee of APSCU, the for-profit colleges' main trade association ($10,000), and Bridgepoint ($9,000). In her first year as chair of the House subcommittee addressing higher education, Foxx received at least $48,668 from people or PACs associated with for-profit colleges. Meanwhile, Democratic representatives Alcee Hastings (FL) and Rob Andrews (NJ) are currently organizing a letter of some Democratic House members opposing a key Obama administration initiative to hold career colleges accountable (the "gainful employment" rule). Each has been a steady recipient of for-profit college money. Already in the 2014 election cycle, Hastings and Andrews have each received tens of thousands in donations from the industry. Hastings' 2012 donor base included for-profits University of Phoenix, DeVry, Keiser, Bridgepoint, EDMC, Full Sail University, Corinthian, and APSCU. He also got campaign cash and had multiple ties to the notorious for-profit FastTrain College, raided by the FBI last year in a criminal fraud investigation. Buying sports. The University of Phoenix stadium is not where the University of Phoenix football team plays; the school doesn't have a football team. But the NFL Arizona Cardinals play in this stadium, whose sponsorship ($154 million over 20 years) is courtesy of your tax dollars -- Phoenix gets 92 percent of its revenue from the federal government. Meanwhile, another for-profit giant, DeVry, has paid an undisclosed sum to be "An Official Education Provider" of the United States Olympic Committee. About 80 percent of DeVry's revenue is from federal tax dollars, so you're paying for that, too. Buying non-profit organizations. The National Urban League has taken major contributions from Corinthian Colleges, and its president, Marc Morial, actually sits on Corinthian's board and gets paid to do so, and has publicly opposed efforts to hold the industry accountable. The ethics watchdog group CREW and Americans for Democratic Action also have taken positions favoring the industry, for reasons still unexplained. Most recently, Apollo Education Group, parent of the University of Phoenix, was named "one of America's most community-minded companies" as they result of a "survey ... conducted by the National Conference on Citizenship (NCoC) and Points of Light, the nation's definitive experts on civic engagement, and published by Bloomberg News." It's not clear what Apollo has done to earn the praise of these civic groups, but whatever value the company is adding in its communities must be weighed against the harm done to many University of Phoenix students who end up with overwhelming debt. Plus the fact that taxpayers are footing the bill for 90 percent of everything Phoenix does. Even with all this wasteful and inappropriate spending by for-profit colleges with your tax dollars, it's not the worst thing about the federal investment in predatory schools. The worst thing is that so many students are deceived into signing up for programs that do nothing to advance their careers -- programs that destroy their financial futures, and harm America's economic strength and competitiveness. The fact that the for-profit college industry is this very week continuing to fight indignantly against Obama Administration rules that would penalize only the worst-performing schools should only increase our outrage and determination to hold them accountable.